We are living in a ‘Golden Age’ of television, according to Brits. 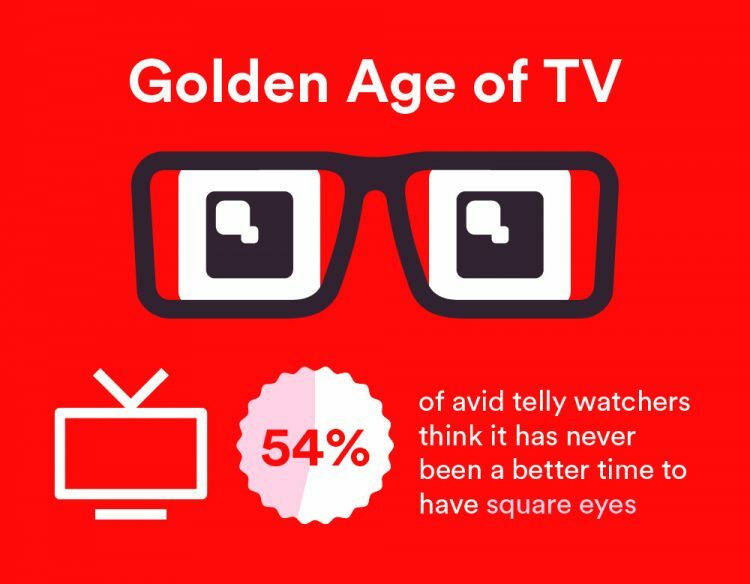 A study into the quality of TV through the decades has revealed 54 per cent of avid telly viewers believe it has never been a better time to have square eyes. Forty-seven per cent even went as far as to say the quality of TV shows broadcast in the last five years are of the highest quality they have ever been. For 42 per cent of viewers the leap in technology means special effects look more realistic and spectacular than ever before. 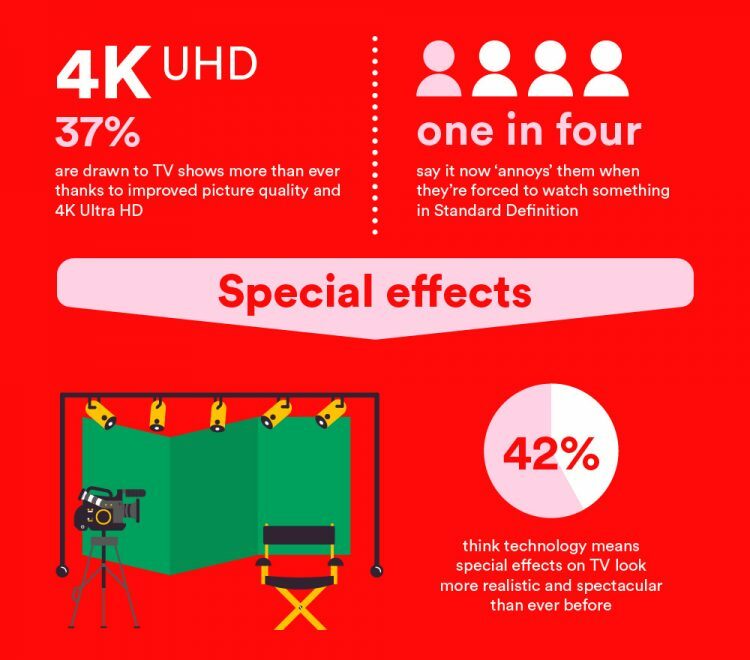 And the poll of 2,000 TV fans found 37 per cent are drawn to the box more than ever thanks to improved picture quality and 4K ultra high definition – which is four times the quality of HD. 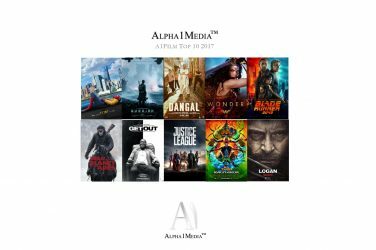 A third also believe the improvement is down to better writers and A-list acting talent getting involved in small screen projects. David Bouchier, chief digital entertainment officer of Virgin Media, which commissioned the research to celebrate the launch of the new Virgin TV Ultra HD channel on Monday, said: “We’re spoilt with an amazing choice of top telly shows from the likes of Breaking Bad, Blue Planet, The Walking Dead, and up to today’s Bodyguard – we’re truly enjoying a ‘Golden Age’ of television. 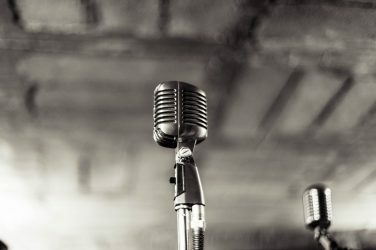 Despite TV looking better than ever, the 80s was named the decade which produced the best comedy shows and sitcoms, with shows such as Only Fools and Horses, Blackadder and The Young Ones making their debut. 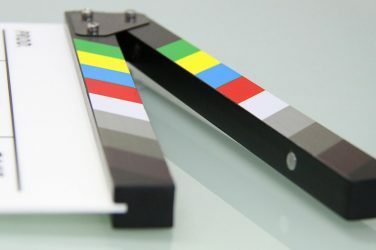 But this decade has produced the greatest drama shows on TV, such as Game of Thrones, Line of Duty and Stranger Things, according to the survey conducted via OnePoll.com. As a result, a quarter have upgraded their television set-up so they could watch their favourite shows in the best possible quality. 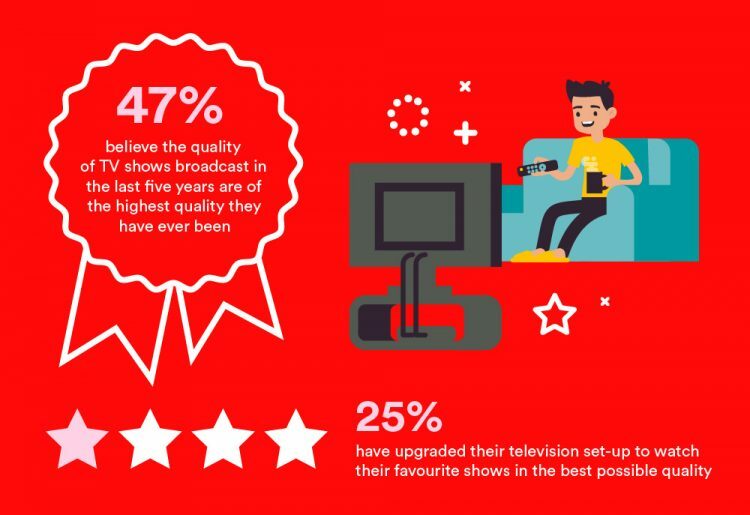 In fact, one in four Brits say it now ‘annoys’ them when they’re forced to watch something in standard definition, and 44 per cent would consider themselves a ‘telly addict’. When asked to consider the iconic TV moments they would like to relive in 4K Ultra HD, the 1969 grainy black and white footage of Neil Armstrong’s ‘one small step for man’ was the most popular choice. Del Boy’s classic comedy fall through the bar in Only Fools and Horses (1989) and England’s 1966 Football World Cup victory are also moments we’d like the opportunity to see in perfect clarity. Audrey Hepburn was named the celebrity most people would like see in 4K Ultra HD quality, followed by Scarlett Johansson and Johnny Depp. 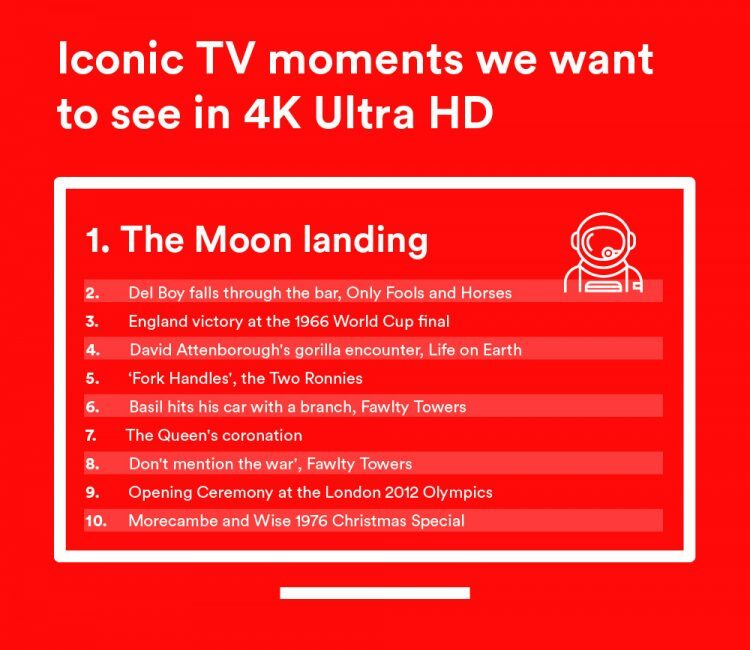 David Bouchier added: “With Virgin TV Ultra HD we’re offering our customers the ultimate TV viewing experience. Virgin TV Ultra HD is the UK’s first dedicated 4K ultra high definition entertainment channel and launches on Monday 17 September on channel 999 at 8.15pm.